In last few years, commercial vehicle telematics market has registered significant momentum, thanks to growing awareness, need for fleet management, adoption in cold chain & logistics segments and penetration in OEM market. 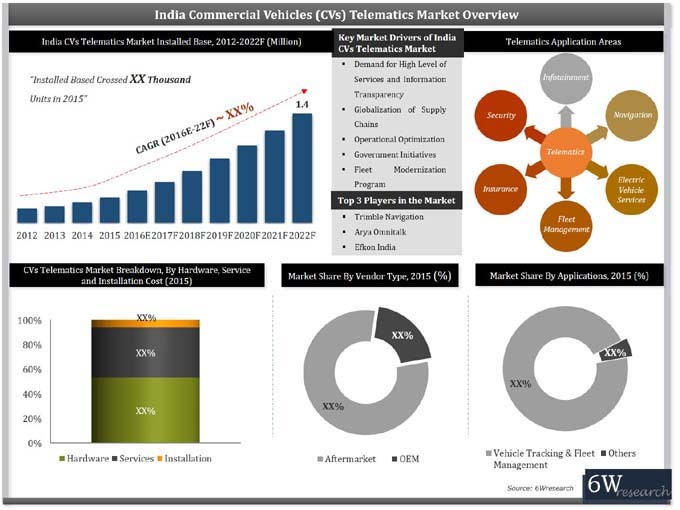 In India's commercial vehicle telematics market, Heavy-Commercial Vehicles (HCVs) accounted for majority of the market share; however, Medium Commercial Vehicles (MCVs) segment is poised to register significant growth over the next six years. According to 6Wresearch, India Commercial Vehicles Telematics Market installed base is projected to reach 1.4 million by 2022. India commercial vehicles telematics market is exhibiting growth as the freight companies are becoming more cautious about their vehicle fuel consumption, on time delivery, repair cost and on road safety. Moreover, commercial vehicle OEMs are collaborating with telematics players to develop in-built telematics system. In addition, prices are declining year-on-year due to increasing competition and adoption in the market. Amongst all end users, cold chain segment has acquired highest share of the overall market in 2015. The report thoroughly covers telematics market by vendor type, installed base, sectors, applications and regions. The report provides an unbiased and detailed analysis of the on-going trends, opportunities/high growth areas, market drivers which would help the stakeholders to decide and align their market strategies according to the current and future market dynamics. 14.1	Arya Omnitalk Wireless Solutions Pvt. Ltd.
14.4	EFKON India Pvt. Ltd.